A beautiful and generously sized duplex maisonette with a large private south facing terrace in the heart of Fitzrovia, Central London.The street is free of any traffic allowing our guests to enjoy a quiet relaxing stay in the middle of London! 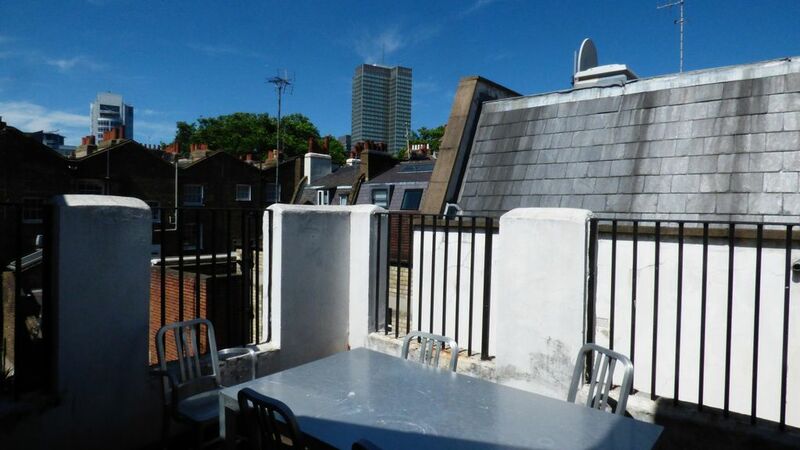 Arranged over the second and top floors of a well maintained Victorian building in the heart of fashionable Fitzrovia, this beautiful large two bedroom maisonette offers bright, modern interiors/whilst keeping its period charm and has a superb south facing private roof terrace. The property comprises reception room with ample dining space and contemporary open-plan kitchen,with divine corian worktops, two good-sized double bedrooms and bathroom suite with separate walk-in shower and separate bath with additional hand held shower.Please see our floor plan. The flat comes fully equipped to make your stay in Central London most enjoyable. No corners are cut on towels or linens/and there are plenty spare for those who don't wish to wash and dry on holiday. Apartment Features: We're happy to arrange our cleaner to come in if this is requested. The living room has a flat LCD TV and DVD player with a selection of DVD's to watch during your stay. .A WI game console is also provided. The flat was fully refurbished less than three years ago and features solid oak flooring throughout, provencial stonework in the bathroom and integrated kitchen appliances.There's a dishwasher/fridge/freezer,ceramic glass hob and plenty of pots and pans for those wishing to cook meals at home. A water filter is also supplied.There's a filter coffee maker, a French Press and an espresso machine. There's an excellent choice of shops that sell fresh ground coffee. We Just added a new sofa bed. Our lovely terrace has plenty of room for outdoor dining(London weather permitting...) and also has a barbecue.The terrace is such a wonderful place to relax after a day out in London. The kitchen has all mod cons and also a selection of cookery books should you wish to experiment at home. There's a selection of grocery shops within a five minute walk of the flat, Sainsbury's, Marks and Spencer, Tesco and Waitrose will have all you need for your stay. There's the independent Villandry on Great Portland St for the more special culinary treat...and also the simply fantastic La Fromagerie for cheese.This is one of the best cheese shops in London. The bathroom has very good water pressure and constant hot water ,so there will be no worries for larger groups staying at the flat.The flat benefits from independent central heating for the somewhat cold British winters. Both bedrooms have wardrobes with hanging space and suitcases can easily be put to the side of these. Cleveland Street is home to a number of local shops, cafe's and restaurants and is well positioned close to Charlotte Street and Oxford Street. Fitzrovia is a neighbourhood in central London, near London's West End lying partly in the London Borough of Camden (in the east) and partly in the City of Westminster (in the west); and situated between Marylebone and Bloomsbury and north of Soho. More about Fitzrovia: This historically bohemian area was once home to such writers as Virginia Woolf, George Bernard Shaw and Arthur Rimbaud, Bob Dylan played one of his first shows just down the road. A few minutes away is Fitzroy Sq...a piece of Georgian design that has aged beautifully.A few more blocks away and one can view the architecture of Nash and his row of terrace houses near Regents Park. For those traveling with young children a visit to Pollocks Toy Museum on nearby Whitfield St will be sure to delight them.The perfect place to pick up gifts for those back home! I have to admit even I go in there and I'm always in awe of the treasures of childhoods past that they have on display.Next door is their theatre print shop...again...well worth a visit. Whilst on the subject of theatre there's the Theatre Bookshop on Conway St with its numerous books on all theatre related matters. The number of restaurants on nearby Charlotte St really is amazing.There's something to cater to every taste and budget! We can assure you that you'll love this street.This street is less than 5 minutes from the flat. The London Zoo is nearby and this should delight all ages. The nearby shopping on Oxford St will be a real treat for people who love to shop until they drop. From high end shops to the two very large budget Primarks,one will find something to take back home with them. After a morning strolling aroud the West End a special treat of a full English Afternnoon Tea will sure to become a special memory of your time in London. Yes, it can be somewhat expensive but it should be something that should be tried if you have the time and budget. The Ritz is by far the best in London.The Savoy, The Dorchester,Browns, and Clariddge's are all expensive but worth it.The National Portrait Gallery,The Wallace Collection and the Langham are more affordable and equally as good. Fortnum and Mason on nearby Picacadilly is also worth it. Their food hall is amazing/and even if you don't have time for the full Afternoon Tea you could buy some tea to take back with you. The tin cans are simply stunning in design.A great gift for those back home. You are renting this flat from Charlene Coleman, the owner. James Koumis is the property manager. There's both a lovely walk in shower and a seperate bathtub that also has a hand held shower. Bath foam and soap is provided.A large heated towel rail will ensure warm towels during the winter months. Moments from Oxford Street,numerous restaurants,galleries, museums,parks and major sightseeing attractions.Excellent transport links. Cable/Satellite TV: Virgin Media with over 60 channels. Video Library: a selection of dvd's are available for our guests to view. Video Game Console: Wi with a selection of games. Music Library: a selection of cd's are available for our guests. Full Kitchen: all mods cons,everything is top notch and it will be a delight for our guests to cook here! Good location close to 2 underground stations. The apartment was clean and the living room was big. This location is in a more quiet/residential area but very easy to walk or take the tube to areas with more bars and restaurants. We had a great stay! Thank you. It's great to hear you enjoyed your stay in Fitzrovia. I hope you choose to stay again on your next trip to London. Shabby Chic decor mixed with modern utilities. We loved it! We loved this place. Great location to see everything and conveniently located near great restaraunts. We had a great welcome from Benedicte who took the time to advise us on the immediate area and nearby tube stations. Our kids loved the London experience and found it easy to travel around by themselves. The great weather had us out most of the day but it was great to get back to this comfortable apartment and relax. Easy option for our next stay in London. Thank you! It's fantastic to really enjoyed your stay in Fitzrovia and found the flat to a great place too! I hope to welcome you back on your next visit to the UK. The flat was great. Open and airy and well equipped. Great centralized location too! We enjoyed our stay here immensely. It was great for our family of four. We stayed a week and wished we could have stayed longer. The owner and manager were both lovely to deal with and made us feel so at home. The flat is great. Our rooms were comfortable and there was lots of space to store our things. The bathroom is fantastic. And we loved the open kitchen/living room area and of course the patio. When we come back to London we’ll dwfinitely be staying here again! Thank you. It's lovely to hear that you and your family really enjoyed your stay and want to book the flat again your next visit to London. The living room is very big that’s unusual for the central London. There’s everything one can need in the kitchen. There is all kinds of entertainment like a TV set, a DVD and a CD players with a big collection of disks. For those who like reading there are a lot of books and touristic brochures. The rooms are just like on the pictures and the beds are comfortable. The flat is clean. Thank you, really pleased you enjoyed your stay. Exceptional Location - Lots of Room! Had a lovely experience staying at this flat. It is exceptionally located next to several tube stops (Warren, Greater Portland) and next to some great pubs (my favorites - Smuggler's Trove and Queen's Head and Artichoke near Regent Park). One thing that stood out about the flat was unlimited hot water (we had 5 people so that was nice) and enjoyed being able to sit outside on the patio when the weather was nice. It is an upstairs flat so there is some stair climbing but we got used to that fairly quickly and it was nice to not be right on the street. This is fantastic to hear. Yes, the two pubs excellent....well done for finding the Queens Head..It's a lovely one with excellent food too!It's technically just over the Euston Road,so more Camden than Fitzrovia but I keep forgetting it's only a ten minute walk..I will add to the list in the flat.The weather was great for your stay so I'm pleased you made use of the terrace.I hope you stay again on your next visit to London. I'm so pleased you enjoyed your stay at the flat.Thank you for choosing it. Situated in Central London ,a few minutes walk to Oxford Steet. There are so many attractions close by that public transport or a car won't be necessary! However, if you do wish to travel outside of the West End ,our flat is within a 5 minute walk of three tube stations. The area is very safe and has very little traffic! Fitzrovia has a village feel to it.It's a very charming area of Central London.There are plenty of independent shops and restaurants as well as numerous art galleries. Fitzrovia is home to several traditional English pubs. We suggest that you have at least one drink in one.If you're staying on a Sunday, a pub Sunday Roast with all the trimmings is a great way to spend an afternoon.Most pubs have lovely outside space,so for those coming to London in the summer months this is a must.We have a selection of good pubs in our guidebook. Art is the word in Fitzrovia. There are numerous Art Galleries in the area. The owners are friendly and don't mind people popping in for a look. Escape the pressure of everyday life as you loosen up within one of London’s finest spas, Spa illuminata. It has been said to give out one of the best massages that you could possibly imagine. Apart from that, it does not give an all female vibe, as it has been a place for the secret male spa-goer. One of the best treatments that it offers is the Decleor Harmonie facial, with scalp, hand and head massage. Spa Illuminata is located in Mayfair.This is about 10 minutes from the flat..
Berkeley Spa would surely help you unwind from the stress of the city as it lets you unwind with certain therapies such as facials and calming massages. Clients swear the results such as soft and rejuvenated skin afterwards a treatment. The Berkeley Spa is located near Hyde Park.15 min from the flat. If you're coming to London with some of your closest girlfriends then a vist to the women's only Sanctuary in nearby Covent Garden is a great day to spend a full day or early evening.This is 7 minutes from the flat. For those wishing to keep fit whilst on holiday one will find that walking around Central London should do the trick.However, a number of gyms now offer daily memberships at a good rate.Good Vibes is an excellent yoga/spinning studio located 5 minutes from the flat.A run in Regent's Park is also a lovely way of getting some fresh air.